James F. Hardymon received his Bachelor of Science (1956) and Master of Science (1958) degrees in civil engineering from the University of Kentucky. After two tours of duty with the U.S. Army, he returned to his hometown of Maysville, Kentucky in 1961 to begin his business career at Browning Manufacturing Company. He held various field and sales management positions both before and after Browning’s acquisition by Emerson Electric Company. From 1976 to 1979, Mr. Hardymon served as president of Emerson’s Special Products Division. He was group vice president and president of the Skil power tools division from 1979 until 1983, when he was promoted to executive vice president. 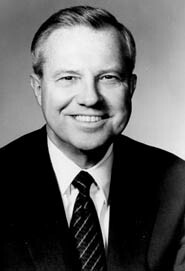 He became vice chairman, chief operating officer and a director of Emerson in 1986 and, in 1988, was elected president. Mr. Hardymon joined Textron, Inc. as president and chief operating officer in December 1989, at which time he was named to the board of directors. He became chief executive officer in January 1992, and was elected to his current position as chairman a year later. Under Mr. Hardymon’s leadership, Textron has posted strong, consistent earnings growth and is the market leader in many of its key industries. He has guided the company’s transition from its holding company roots to an actively managed operating company with a consistent focus on growth and improvement in its core businesses. Textron, based in Providence, Rhode Island, is ranked 149th on the Fortune list of the 500 largest U.S. industrial companies, with operations in four core business segments: aircraft, automotive, industrial, and finance. These include familiar names such as Bell Helicopter, Textron, Cessna Aircraft Company, and Avco Financial Services. Mr. Hardymon is a member of the University of Kentucky Board of Trustees and is a University of Kentucky Fellow. He was inducted into the College of Engineering Hall of Distinction in 1995. Mr. Hardymon and his wife, Gay, currently reside in Lexington, Kentucky, and are the parents of two children.